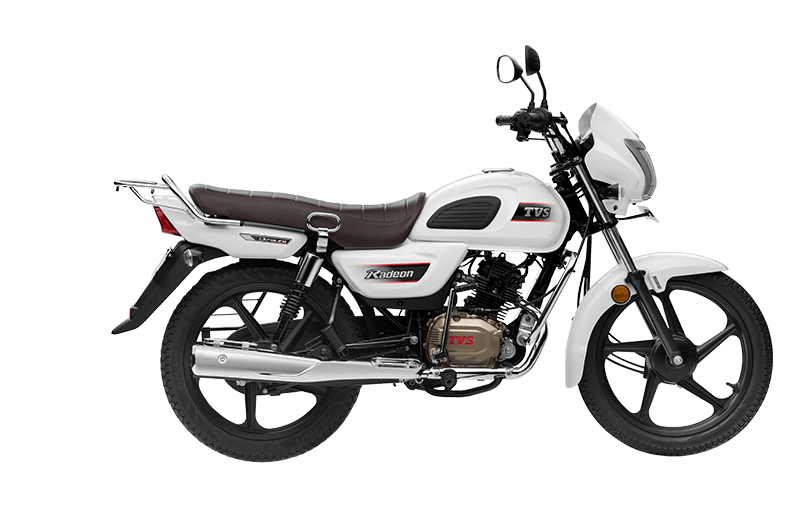 TVS Motor Company, South India’s largest two-wheeler manufacturer today launched a new 110cc commuter motorcycle – TVS Radeon. A unique combination of sturdy metal build, robust style and plush comfort, TVS Radeon is targeted at the confident self-made Indian man. With the inclusion of this offering, TVS Motor Company’s robust commuter motorcycle portfolio has been further strengthened with a clear emphasis on developing products which not only meet distinct customer requirements but also create customer delight. Over the years, TVS Motor Company’s unwavering focus on quality and reliability has yielded contemporary, and attractive products for the market. With segment-leading features, TVS Radeon combines our values to deliver best-in-class durability, performance and attractive styling. We are confident that the discerning progressive customers across the country will appreciate and swiftly adapt to its robust proposition. We are delighted to launch TVS Radeon here today, targeting the discerning progressive customers. TVS Radeon boasts of multiple first-in-class features and usage-led design, which offers strength, comfort, and style without compromising practicality. 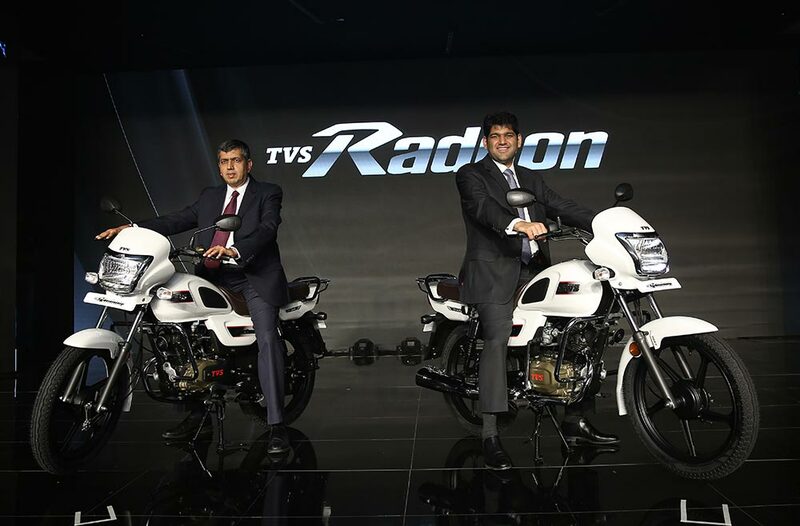 I am confident TVS Radeon will find favour with our consumers, who are looking for a strong, comfortable and durable motorcycle. TVS Radeon promises a sturdy and reliable experience for its customers, complete with a solid body, which is complemented by a strong steel tubular chassis. The specific design ensures longevity of the motorcycle. The motorcycle is equipped with Synchronized Braking Technology, a first-in-segment1 feature, which provides superior braking control and minimises skidding thus ensuring safety of the rider. The side-stand indicator is equipped with a beeper2 to avoid accidents. The larger 18 size wheels coupled with the Dura Grip tyres provide better grip and comfort for the rider. TVS Radeon boasts of the largest cushioned seat in the segment, both in terms of length and width. The telescopic oil damped front suspension together with 5-step adjustable rear hydraulic shock absorber aid both comfort and longevity. The motorcycle provides a steady ride boasting of a long wheelbase of 1265 mm coupled with the high ground clearance of 180 mm. The riding experience is made seamless with a low seat height, self-start and handy functional features like a USB charging spot and convenient pillion grab-rail. TVS Radeon houses a long lasting 109.7cc Dura-Life engine, which is designed to offer an optimum combination of power and fuel economy. The motorcycle churns out 8.4 PS of power @ 7000 rpm with a torque of 8.7 Nm @5000 rpm. TVS Radeon is equipped with 10-liter tank and clocks a fuel economy of 69.3 kmpl. Complete with a 5-year warranty, TVS Radeon comes in a colour selection of White, Beige, Purple and Black: Check All TVS Radeon Colors with Photos.